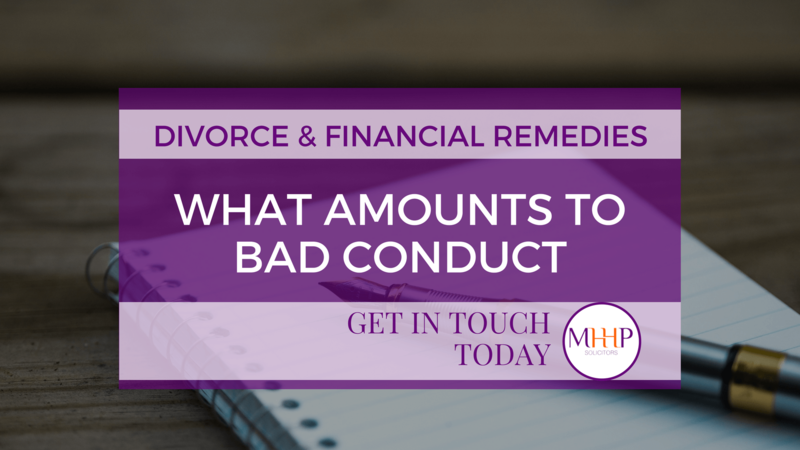 One of the sections on form E allows for details of a spouse's bad behaviour or bad conduct to be set out if you feel it should be taken into account in your case. When deciding how matrimonial assets are to be split on during the divorce process, the court takes into account a number of factors as set out at Section 25 Matrimonial Causes Act 1973. These proceedings can include anything from both parties income to complex agreements. One of these is conduct and Section 25(2) MCA 1973 states that the court should have regard to "the conduct of each of the parties if that conduct is such that it would in the opinion of the court be inequitable to disregard it"
This is a high threshold. "Bad" behavioural issues such as infidelity and your partner generally being unpleasant will not ordinarily be considered by the court as relevant to the division of assets. Judges are also reluctant to examine the reasons shared for the marital breakdown. In some cases, I have found clients also referring to involvement with financial contributions they continue to make for example if they are paying the mortgage and their spouse is not, they assume this to be bad conduct (and should be considered for their case). There is a different section within form E which asks about the contributions you have made to the marriage and it may be fitting to put such information in that section. So what does amount to bad conduct or behaviour? In the extreme case of H v H (2005), the husband was convicted of attempted murder of his wife. His behaviour was taken into account by the court and the court order provided the husband a settlement with just a small portion of the assets. Gambling away a significant sum and failing to make proper disclosure was considered as bad conduct in the case of separation between Morgan v Morgan (2006). More recently, a conduct finding was made against a husband in the high net worth case of R v B and others (2017) where the husband was found to have been guilty of fraud and irresponsibly dealt with the family's financial business. If you are unsure of your rights, or whether your spouse's behaviour is likely to be relevant, it is worth bearing in mind the above and checking the position with your Solicitor. For expert legal advice on Family Law, help or any information on our services, please contact Tayo Taylor at MHHP Law Solicitors on 020 3667 4783. We offer a Free 30 minute consultation which you can enquire about through our website’s contact page. This entry was posted in Family Law and tagged divorce and financial remedies, divorce law, family law by Tayo Taylor. Bookmark the permalink.